Chosen by George Washington for its strategic location and designed by the French architect Pierre L’Enfant in 1791, the U.S. capital boasts green parks and wide tree-lined streets, as well as such grand structures as the White House, the Washington Monument and the Lincoln Memorial. Favorite restaurant: The Jefferson, 16th and M Streets, tel: + 1 202 347 2200. American cuisine, delicious steaks. Favorite attraction: Washington After Dark, a nighttime ride through Washington offered by every hotel. Best-kept secret: National Gallery of Art, National Mall, tel: + 1 202 737 4215, among the most beautiful galleries in the world. Advice: Definitely take more time to visit Washington than you originally planned. If you stay several days, rent a car. managing partner, Squire, Sanders & DempseyFavorite hotel: Willard Inter-Continental, 1401 Pennsylvania Ave NW, tel: +1 202 628 9100. The Willard is a unique old hotel, located close to the White House and Capitol Hill, full of history and beautifully restored. Favorite restaurant: Oceanaire Seafood Room, 1201 F St NW, tel: +1 202 347 2277. A small, expensive chain – very good fish. Favorite night club: Blues Alley, 1073 Wisconsin Ave NW, tel: +1 202 337 4141. Good for music (jazz and blues), but no dancing. Favorite attractions: The Jefferson Memorial (Montpellier) and the Tidal Basin during cherry blossom time. These are for free! Best-kept secret: America’s colonial history, which can be seen very close to Washington, D.C., in Old Town Alexandria (Virginia). Favorite shop: Tiny Jewel Box Inc, 1147 Connecticut Ave NW, tel: +1 202 363 6878. Antique jewelry. Advice: To see the “sights” in D.C., use the metro (subway) or Tourmobile (runs all day, stops at all the main tourist sights). 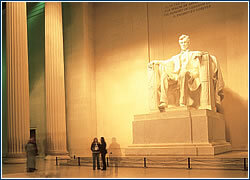 Favorite attractions: National Air and Space Museum, 7th Street and Independence Ave, tel: + 1 202 357 2700. The next best attraction is the National Cathedral at Wisconsin Ave.; a perfect copy of gothic cathedral built in the 20th century. Best-kept secret: Hillwood Museum, 4155 Linnean Avenue, tel: +1 202 686 8500, with valuable collections of French and Russian art, and a beautiful park that in the spring blazes with the colors of azaleas and rhododendrons. Favorite shop: Appalachian Spring, Massachusetts Ave. near N. Capitol St., tel: +1 202 337 5780. Small chain of stores where you can buy local-made wooden or glass crafts, including typical quilts. Advice: Washington is a beautiful city full of green parks. Don’t be afraid to use public transport; the subway is very clean. Alexandria and Georgetown, with their quaint atmospheres, are worth walking through. Basic factsLocation: District of Columbia, USA. Population: 572,000 (city); 42 million (metropolitan area – DC, five Maryland counties and five Virginia counties). Ethnic mix: Majority white and African American, with minorities predominantly Hispanic and Asian. Time zone: GMT – 5 (Eastern Standard Time); GMT – 4 from first Sunday in April to second Sunday in October. Electricity: 110/120 volts AC, 60Hz; American-style flat two-pin plugs. Average January temp: 2° C (37° F). -this city-specific search engine and portal page is like having the phone book at your fingertips. http://www.digitalcity.com/washington/ – a good site for finding events and planning entertainment. 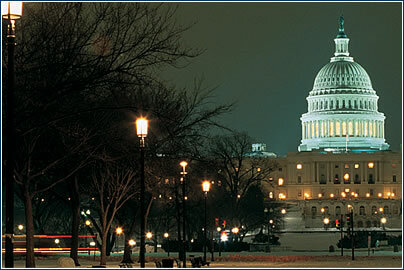 http://www.worldexecutive.com/cityguides/washington/ -aimed at the business traveler, this is a useful site for accommodation and sight-seeing. – web site of the convention and visitor’s association. http://www.lonelyplanet.com/……/washington_dc/ – a “liberal” overview of the nation’s capitol, from the folks at Lonely Planet. 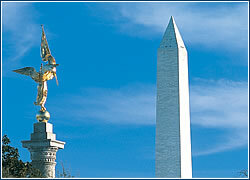 http://www.allaboutwashingtondc.com/ -an informative, if somewhat generic, guide to travel and tourism in Washington. http://www.washingtonian.com/ – this online magazine serves as an “insider’s guide” to the city. · Federal government departments, such as the Department of State, the Treasury, the IRS, the Department of Justice and the US Supreme Court, make the federal government Washington, DC’s premier industry. Although Pennsylvania, New Hampshire, Massachusetts and New York avenues border the main business district, other areas of the city are beginning to attract corporate business. · The city’s next most important industry is tourism. Within the DC area is the fourth largest concentration of hotel rooms in the USA. Approximately 20 million visitors arrive each year, to explore the wealth of free museums and attractions in the city. The city has also attracted the headquarters of organisations such as Marriott, Amtrak, Mobil Oil, MCI Telecommunications, Gannett News, US Airways, the World Bank and the International Monetary Fund (IMF). · Generally, American businesspeople are more informal in their work attire than Europeans are, although in Washington, DC, men always wear suits and women stylish and conservative business attire. National and international organizations tend to be more formal, although smaller companies now operate a smart-casual clothes policy. Although working hours are often much longer, business hours are generally Monday to Friday 0900-1730. · It is quite common for meetings to be held over lunch, although the prohibitive cost of eating out in the city at traditional business venues means that some companies bring in outside caterers to the office for important, large-scale lunch meetings. Business dinners tend to take place in restaurants rather than at home. Cocktails after work are commonplace. The use of business cards is routine.